Practicing nurses can earn their B.S.N. while still providing excellent care to their patients. If you are ready to take your nursing career to the next level, our LPN-B.S. program is for you. Offered in Sioux Falls, this program is designed for working professionals. Courses are offered in eight-week sessions and in a little more than two years, you can finish your Bachelor of Science degree. The Master of Arts in education is designated to provide you a significant advantage in a broad range of educational settings. Acquire an MBA with an entrepreneurial and strategic leadership or trust management slant. Prepare to succeed in smaller, non-publicly traded businesses in our region, or cast a wider net and explore opportunities with larger organizations. Designed specifically for pastors, this flexible one-year program is structured around a typical church calendar. Participants will regularly consult with their personal mentor who will provide guidance and support in the execution of applied projects. Earn a graduate certificate in Trust Management and improve your ability to build and maintain relationships with clients and corporate partners in the field of high net-worth planning. 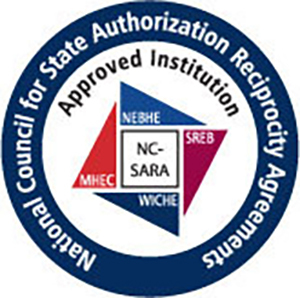 DWU is an NC-SARA approved university. More information. As an active leader, collaborative partner, and incubator for economic growth and entrepreneurial thinking, DWU’s distinct tradition of delivering a personalized education grounded in our values of learning, leadership, faith and service will be present in these online programs. DWU’s online experience lets you complete courses 100% online, anytime and anywhere. You decide what is most convenient for your schedule. Dakota Wesleyan University Online is a digital community where you can develop lasting relationships with faculty and classmates. Our flexible and asynchronous course model allows for a healthy work/life balance while you pursue your educational goals. Specifically, at DWU you’ll participate in classroom discussions, submit coursework, and communicate with faculty and classmates during the time that suits you best. At DWU, we don’t believe in busywork. Through meaningful collaboration and projects, we believe in providing you with information, knowledge and newly refined skills that you can apply immediately. Even in the online environment, our professors will be accessible to you and supportive of you. They will provide mentorship and guidance so you can achieve your goals. All of our programs are designed to prepare you for leadership roles upon graduation. You can complete our M.B.A. in one year (as a full-time student) and our other programs in 14-26 months.